The Metallizing Division was set up in 1969. Holster Engineering has continued to be at the fore-front of industry using all Metallizing equipment such as Plasma, Flamespray, Arcspray, HVOF, HVAF along with Robotic automated traverses. Our expertise will help give you the most advanced metal spray technology and with our knowledge in surface engineering we can offer a wide range of uses from universal corrosion protection to all aspects of engineering coating applications. 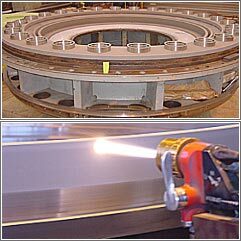 Holster Engineering Co (2003) Ltd is the only Metallizing Company to currently hold Lloyds Register approval for Flame-Arc-Plasma and HVOF spraying of engineering components in New Zealand.